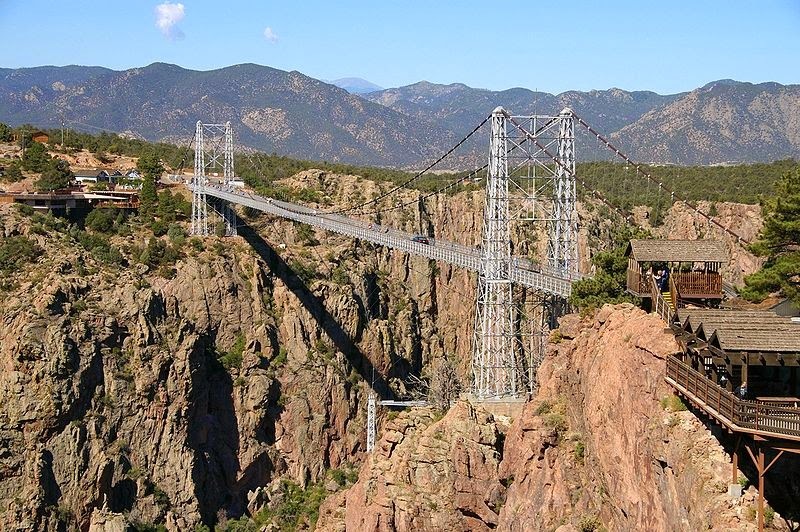 Colorado’s Royal Gorge Bridge and Park re-opened to the public on Labor Day weekend 2014 with the completion of a new 14,500 foot Visitor Center, Silver Rock Railway (a mini-train), and the Royal Rush Skycoaster. Summer would be an ideal time for your family to check out this time-tested attraction. About 3 million years ago, as the Rocky Mountains rose from the surrounding plains, a small rivulet that would become the Arkansas River rose with them. Eventually, it cut a deep channel through the surrounding granite, at a rate of about one foot every 2,500 years, creating what we know as the Royal Gorge near Canon City, Colorado. The gorge’s peculiar shape can be attributed to this long, direct erosion through hard rock. With a width of 50 feet at the base of the gorge and a few hundred feet at its top, and a depth of 1,200 feet in places, the 10-mile-long canyon is a narrow, steep crevasse that has attracted visitors for more than a century. In 1907 the federal government donated the gorge to Canon City to be used as a municipal park. As a practical measure, a bridge was needed to cross the gorge and unite the two highest points. A pedestrian bridge—the highest suspension bridge in the world--was built in 1929. At 1260 feet long, it’s no wonder it became a tourist attraction and designation on the U.S. National Register of Historic Places. Get your adrenalin flowing on the Royal Rush Skycoaster, which swings out over the Royal Gorge, momentarily suspending participants 1,200 feet above the Arkansas River. Don’t forget to visit a museum and learn about the Royal Gorge region’s rich history, drive the Gold Belt Tour Scenic and Historic Byway, or walk with dinosaurs at the Garden Park Fossil Area—called the greatest dinosaur graveyard in the world. Need more thrills? Take in a whitewater rafting adventure on the Arkansas River or go off-road on a Jeep tour. Get a true taste of adventure by zooming 1,500 feet down into the gorge in a helicopter. Not for the faint of heart, the helicopter dives and climbs the gorge, grazes the river, and skims over the bridge at speeds of 150 mph. Or try zipping over canyon walls, the regions newest outdoor adventure. Colorado Zip Line Tours near the Royal Gorge offers 20 zip lines including classic and extreme courses. Royal Gorge Zip Line Tours offers an exhilarating tour across the Royal Gorge plateau or near the Arkansas River, where you’ll have beautiful views of the 14,000 peaks of the Sangre De Christo mountain range. See the gorge on a helitour. The Mini-Train and the bridge itself will give visitors an exciting experience. The new North Visitors Center features food service, indoor and outdoor seating, and a gift shop. Lodging options in the area include everything from budget RV parks and camp grounds to guest ranches and Bed and Breakfast accommodations. There’s something for everyone, at Royal Gorge Bridge and Park, from kiddos to teens to adults. All ages can experience the breathtaking views, exhilarating thrills, and historical treasures that abound in this 360-acre natural wonder. Check the website for schedule, specials, and updates. Photos from Royal Gorge website.